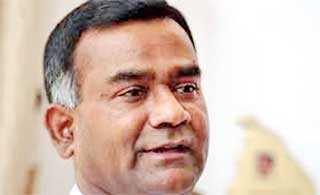 The Plaintiffs and the Defendant in the case against former UNP General Secretary Tissa Attanayake, accused of producing a forged document to media, informed the Colombo High Court yesterday that they are willing to reach a settlement in the case. The relevant parties made a request to the Court when the case was taken before High Court Judge Vicum Kaluarachchi. President’s Counsel Kalinga Indratissa, appearing for Attanayake, informed the Court that the Defence has discussed with the Plaintiffs on reaching a settlement. He requested the Court to set a date to present submissions to inform the progress of the discussions. President’s Counsel Nissanka Nanayakkara, representing the first witness Prime Minister Ranil Wickremesinghe, and Attorney Lakshmi Jayawickrema, representing the second witness President Maithripala Sirisena, also have informed the Court on the ongoing discussions regarding the settlement. Accordingly, the High Court Judge ordered the case to be called again on 4 April, and informed the two parties to report the progress of the discussions. The Attorney General on 9 September 2016 filed charges against Attanayake in the Colombo High Court, on producing a document with forged signatures of then-Common Opposition candidate Maithripala Sirisena, and then-Opposition leader Ranil Wickremesinghe, during the 2015 Presidential Election campaign. The document was alleged to be a secret agreement between the UNP National Leader Ranil Wickremesinghe and then-Common Opposition candidate Maithripala Sirisena.Attanayake was charged under the Presidential Elections Act for displaying the forged document to the media, thereby affecting the candidate Sirisena’s presidential campaign. President Maithripala Sirisena and Prime Minister Ranil Wickremesinghe have been named witnesses in this case, and they have been issued summons four times to appear before the Court, but they have not appeared before the Court for official reasons.